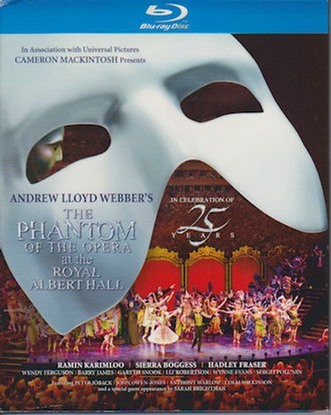 The Phantom of the Opera at the Royal Albert Hall was a special presentation in honor of the show’s 25th anniversary, and featured Ramin Karimloo as the Phantom, Sierra Boggess as Christine, Hadley Fraser as Raoul, and Wendy Ferguson as Carlotta. The negatives for this video are mostly technical, including the need to use rather obvious microphones on wires near the performer’s mouths to get the audio quality needed for recording. These aren’t actually that obvious from the audience, but they show up very clearly in high definition video. The function is made more obvious by the far less obvious presence of the tiny, wig mounted microphones used for the theater’s sound system. Those work just fine in a theater, where the amplification is augmenting the singer’s natural voice, but at that time the quality wasn’t quite good enough for high quality audio recording. Another thing that is more obvious on video are the LED panels used as backdrops. These allow quick scene changes in what is, after all, a concert hall and not a theater, but if the camera gets very close the individual LEDs become visible. It’s a bit like sitting too close to an old television. As it wasn’t practical to rig the Albert Hall’s chandelier to fall onto the stage, pyrotechnics are used instead. The orchestra is above and behind the actors, which isn’t so much a negative as just another limitation of the venue. It’s a much larger cast than you’d normally see on stage, to the extent that the usual mannequins employed in “Masquerade” are here replaced by live dancers. A larger orchestra, too, though Lloyd Webber does tend to insist on more musicians than most Broadway producers seem willing to pay for these days anyway, and more power to him. Why should opera houses be the only place you hear the accompaniment played by the number of instruments it was written for? Okay, that’s the technical stuff, and it’s mostly things you’re really only going to notice on video. During an actual performance you don’t get close enough. Now for the wonderful parts. The performers are fantastic. Sierra Boggess originally played Christine in Las Vegas, and Ramin Karimloo was one of the more popular West End Phantoms. Boggess is perfectly cast as Phantom’s young Christine, with a clear, light soprano voice that handles the difficult role, including that slightly ridiculous high E at the end of “Phantom of the Opera,” very well indeed. Karimloo is considered by many to be this generation’s definitive Phantom, just as Crawford was in 1986. He can sing, and he can act, and he does a wonderful job of bringing out the tragic character of the Phantom. He’ll be making his Broadway debut in 2014, playing Valjean in the revival of Les Misérables. I suppose you’d call this a semi-staged version, to the extent that there’s no proscenium, and stage effects are somewhat limited by the design of the hall. It hardly matters, though. The music is still superb, as is the cast. This is far superior to the movie. Even better, the curtain call is merely the prelude to a mini concert, with former Phantoms Colm Wilkinson, John Owen-Jones, Anthony Warlow, and Peter Jöback joining Karimloo to sing the title song with Sarah Brightman. Andrew Lloyd Webber puts in an appearance, as does Michael Crawford, who quite literally rushed over to put in an appearance after a performance of the Lloyd Webber version of The Wizard of Oz, though he doesn’t sing here other than joining in on an ensemble number.